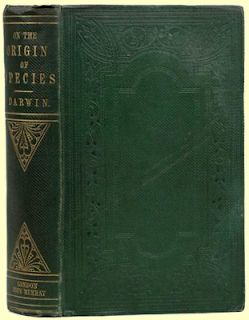 "On the Origin of Species by Means of Natural Selection, or the Preservation of Favoured Races in the Struggle for Life" or as we most often call it "The Origin of Species" is the magnum opus of Charles Darwin, it is also the subject of today's "O" post. 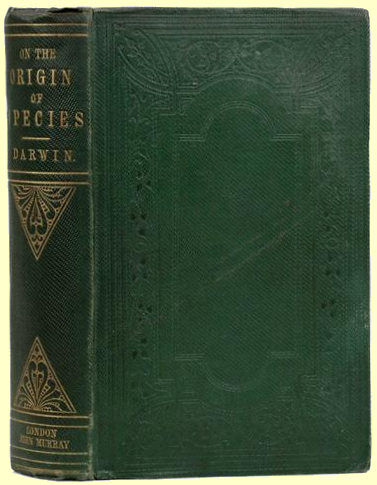 When "Origin" was published in 1859, Charles Darwin had already made a name for himself as a naturalist, scientist and writer. It is not too much to state that this is one of the most important pieces of scientific literature on the subject of biology ever written. It is not the first book on evolution ever written, but it certainly was at the time the most well known. It is also not without flaws, which the anti-evolution crowd are quick to point out. But reading the text today, I get a sense of amazement over Darwin's observations. Observation is still the first, best tool in science. It is also interesting that the whole "man came from apes" flap that this book supposedly caused is not even in this book. Human evolution is only a very small part of it. Fully half the book is about domestication of animals. How over generations we (as in Humankind) took the wolf and domesticated it into the dog we know today and indeed all the various breeds we know today. That's evolution at work. Sure it was faster than natural selection, but natural selection works on a time frame of millions and billions of years, not just thousands. There are a lot of things people think this book is, but really isn't. It is not a justification for slavery (the bible does that. It does not cover the origins of life, only how today's species may have come about from others. It does not say "We come from apes" or anything of the sort. Darwin does ask why haven't the apes evolved to the intellect of man yet. Remember this was 1859. DNA had not been discovered yet and the proper means of fossil dating had not been developed yet (radio-carbon dating was still 90years away). This was not the first text, and it certainly wasn't the last. This book is a absolute classic of scientific inquiry and though. One I feel is on par with Galileo's "Dialogue" (which he spent the rest of his life under house arrest for because of the Church) and Newton's "Principia". Great science has always been treated poorly by the church and the faithful. They answer the questions that until now had been the sole proprieties of the clergy and gods. Darwin was never jailed or excommunicated, but his work is still pilloried today by the fearful and the ignorant. Do yourself a favor and read his work for yourself. My great, great uncle was one of the first to write about Darwin in children's textbooks, and he got death threats. Kudos to you for writing about it.